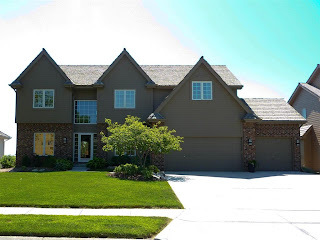 Angela May's Omaha Nebraska Real Estate Blog: Stunning Views and $150K in Custom Touches! Open House Sunday, Septemeber 18th from 3pm - 5pm! 28 Thrifty Ways to Customize Your Kitchen! Stunning Views and $150K in Custom Touches! Open House Sunday, Septemeber 18th from 3pm - 5pm! Pristine Condition Home with Stunning views, Custom Touches and 150K in Updates! The Custom Great Room Addition has Rustic, Beamed Cathedral Ceilings and a Stone Fireplace. Many features in the Kitchen include; Granite Counters, Modern Glass Front Appliances, Hardwood Floors, a Center Island, and Double Ovens. Enjoy the Formal Dining Room for special occasions and the enclosed Den for working at home. The Huge Master Suite has a separate Sitting Area, gorgeous Hardwood Floors and a Trey Ceiling. Relax in the Luxurious Master Bath with a Large Jetted Tub, Stone Flooring and Shower, His & Her Vanities and an amazing custom closet. All other Bedrooms boast Walk-In Closets and Private Baths including a Jack and Jill. The Huge Walkout Lower Level includes a Wet Bar, Exercise Room Addition, 5th non-conforming Bedroom with a Walk-in closet, 3/4 Bath and Media Area. Outside, enjoy Beautiful Landscaping and Sunset Views over the Water from the Trek Deck, or descend the Spiral Staircase to the Covered Paver Patio with Relaxing Fountain. New driveway, professional landscaping, Elkhorn Schools & more!